I got the bug to pick back up where we left off on the downstairs hall closet (abandoned stairwell). Back in 2007, we started converting the steps into proper shelves, but we’ve done nothing but pile more crap into the closet since then. Over the last week, I finally brought some power (including a light) and some network cables for our wireless router into the formerly uncivilized space. 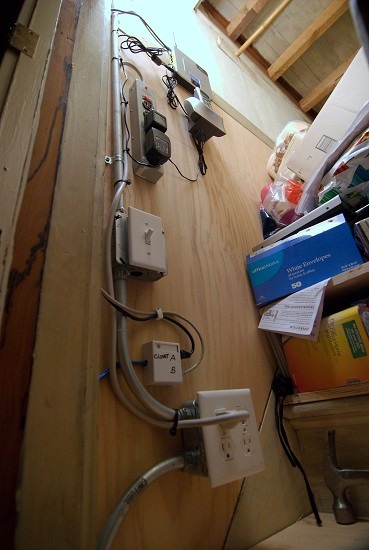 I’ve been wanting to move the router to the ground floor for a long time, because it performed pretty poorly in the basement utility room, being blocked by the ductwork and the furnace. While I was at it, I relocated our phone’s base station here, too, since it suffered from the same problems as the wi-fi. Both are working much better than they were before. And if you’re wondering why I did such an overkill, industrial job with the electric conduit, it’s because I scavenged about 200′ of conduit and dozens of handy boxes when my company’s office was being remodeled a few years ago. The contractor was going to send it all of for scrap, so I grabbed as much of it as I could. It’s been taking up space in the garage for over 3 years, so I get all excited any chance I get to pull out the conduit bender and actually get to use some of it! Gotta love a woman who owns her own conduit bender!